According to an informal Colonel poll earlier this week, the majority of undergraduate students at the University of Kentucky will be voting for Mitt Romney in the upcoming presidential election. The poll, conducted from a random sample of 535 current UK undergraduates, reveals that Romney has a slight edge over Barack Obama, who in turn has a slight edge over [NBA power-forward] Anthony Davis. Obama took second place with 24 percent of the vote, followed by Davis with 22 percent, Calipari with 10 percent, and [comedian] Louis C.K. with 6 percent. UK alum Ashley Judd took fifth place in the poll with 4 percent, or 22, of the votes. A Colonel poll of 535 current UK undergraduates revealed that 27 percent of students plan on voting for Romney this election season. 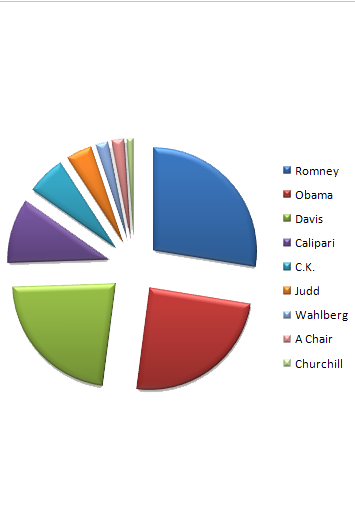 Obama took second place with 24 percent of the vote, followed by Davis with 22 percent and Calipari with 10 percent. When asked why they chose the candidate they did, students expressed a scattershot of reasons for their support. When asked if he thought Calipari would remain committed to UK’s basketball program even if he did become the next president, Arbuthnot seemed confident that Calipari knew just how much more important UK hoops are than running the country.